I made it to Sinai. I was there with my people. All six rabbis, my family, my friends, my community. I heard the various views. The views of the rabbis as they courageously shared with us their personal G-d idea. They shared this through the words of Torah, a piece or verse that spoke to their viewpoint, their experience of G-d. Some had tangible experiences that moved them emotionally. Some knew G-d through the theology, the philosophy of Oneness. Some knew G-d through action, moving forward, helping others. Some knew G-d in the purity of heart. Some knew G-d in silence. In the small, still place. We also sang. Meditated on the words. Responsively. We imaged. We searched and found. Then we heard it, spoke it. 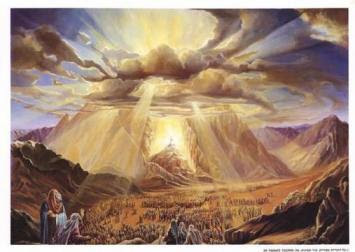 And then we gathered around the mountain, opened our Torah, heard the 10 phrases, or better known as the 10 commandments. We were linked, arm-in-arm; we heard the soft, intimate phrases. Instinctively, we knew where we were supposed to stand. Together. In the place meant for us. There are some moments in time that help to re-center me. That remind me that I am at the right place, with the right community, in a mode of growth and movement, amongst friends, leaders, teachers, family. Beautiful....too bad neither of us could make it after all. We both really missed everyone!